This is such a well-crafted movie. The direction shows real experience at creating tension and building interest; the acting brings out the inner live of the characters; the cinematography crosses eras and continents with images and lighting that are always right and sometimes gorgeous. This is a true story and an exceptional movie about what is for many, an excruciatingly-boring subject: the game of Chess. If you have no interest in the game, you may struggle with this movie. But if anyone can make that entertaining, director Ed Zwick can — and he does it best here. He is a man of extraordinary talent who tackles heroic subjects (“Glory,” “Courage Under Fire,” “Legends of the Fall”) and always gets superior performances from those he puts in his usually small cast. Here, he casts Tobey Maguire as Bobby Fischer, once the youngest Grand Chess Master in the world. At the Chess board he was calm and focused; elsewhere, he was a paranoid delusional schizophrenic who heard voices, believed others were listening to him through his television set, and was sure he was being followed. Maguire does a terrific job at capturing and expressing Fisher’s inner demons and delusions; he rages and rants and reverts to threats and retaliation. The movie is as much about his inner life as it is about his external gamesmanship. Liev Schreiber, as Boris Spassky is the silent, stoic, and coolly-confident Russian, physically imposing and mentally challenging. But the real differentiating factor in this movie is the collaboration between director Zwick and his cinematographer Bradford Young (who also shot “Selma.”) It results in phenomenal work. Every shot feels authentic; the camera is ALWAYS in the right place to capture the emotion, to control the pace, to build the suspense. In most cases, there are just two men sitting across from each other and moving pieces on a board; how interesting could that be? In the hands of these masters – it’s absolutely immersive and engrossing. This is my early nomination for Best Cinematography at Oscar time. 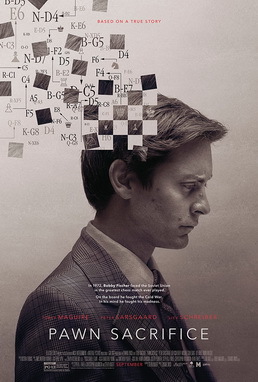 Zwick’s genius is to convince us that this movie is only partially about the game of chess; really, it’s really about the thought-processes, dedication and demons of one of the greatest champions to ever play this game. And, as such, it’s a work of cinematic art.